What is the temperature difference of hotfix rhinestone in different sizes? Your here： Notice » What is the temperature difference of hotfix rhinestone in different sizes? For hotfix rhinestone in different sizes, is the temperature same? Normally, the smaller of the rhinestone, the lower temperature . Taking the example of SS6 rhinestone, it is because that the crystal facet and thickness is small, and the fast heating transfer, it requests lower temperature, usually, 140 degree will be just ok.
For the bigger size like SS30, in contrast, it will require higher temperature because of the bigger and thicker glass face, which will be around 150 degree normally. There are different rhinestone size on one motif, what is the best temperature? It will be tested according to the situations. Normally, if the sizes are between SS6 to SS30, the temperature will be 140-150 degree. Ask: if there are MAX difference size in the same motif, how to heat transfer? The solutions will be more than the problem, more detail, please pay attention to our website. 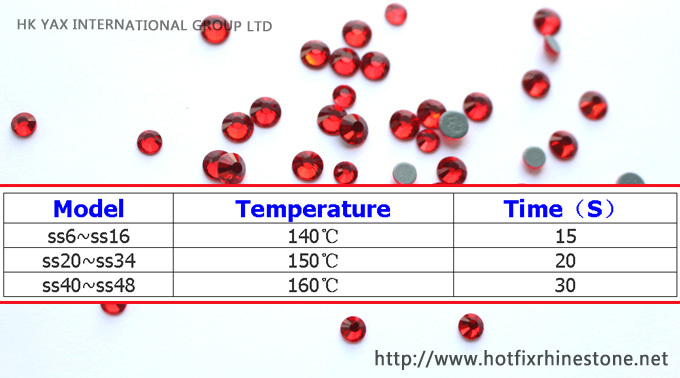 What is the temperature difference of heat fixed rhinestone in different sizes? For heat fixed rhinestone in different sizes, is the temperature same?